The entire cast is excellent as they portray a very real time in American history. Kerri Russell is certainly the stand out of the show. How well do you really know your friends and neighbors? They live among us, hiding in plain sight. In the 1980's cold war era, Russian spies infiltrate American society and feed intelligence back to the KGB and other countries. Trained to "blend in" these seemingly normal Americans could be anyone you know. 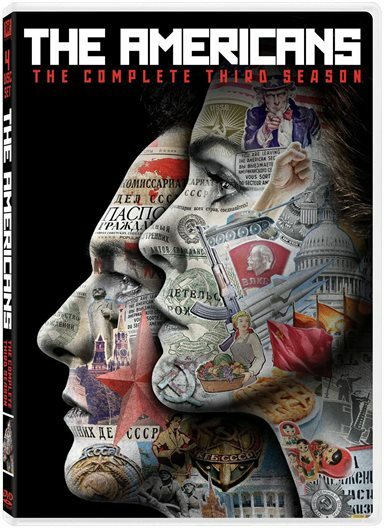 That is the premise of The Americans, starting its fourth season this week on the FX network, and to celebrate, Season three on DVD has hit stores. Season three ups the ante with the Centre requesting Elizabeth (Keri Russell; Felicity) and Phillip (Matthew Rhys; Brothers and Sisters) recruit their daughter, Paige (Holly Taylor; The Otherworld) as the second generation of "illegals". As Paige searches for her identity and religion, her parents stall in order to try to protect her. Meanwhile, Stan (Noah Emmerich; Super 8) does his best to unsuccessfully win Sandra (Susan Misner Chicago) back and Gabriel (Frank Langella; Frost/Nixon) is now working as the Jenning's handler. Ultimately, things come to a head as Paige figures out something isn't right and Elizabeth and Phillip divulge who they really are. This season sees the spy game follow the Soviet-Afghan conflict, as the Russians attempt to find out who in the CIA is working the Afghan operation. There is a newfound sense of urgency and patriotic duty as the conflict heats up and puts their own countrymen in danger. There is also some emphasis regarding Reagan's attitude towards apartheid. The entire cast is excellent as they portray a very real time in American history. Russell is certainly the stand out of the show for me, but her performance is certainly enhanced by Rhys. Together, they make a formidable team that, I believe, is key to much of the show's success. Taylor also does a nice job portraying a teenage girl dealing with a knowledge that is well beyond her comprehension. The realistic attitude of the show is what makes it so unique and what gives it the genuine feel it has maintained from the beginning. The fight scenes aren't some flashy Hollywood make believe, but seem as though what could actually have happened. There are some especially tense and violent episodes that may make viewers uncomfortable, but they seemed to be necessary to make a point. The DVD extras are nothing worth spending much time on, as there are only two. One is the seemingly obligatory deleted scenes that don't add much to the season (which is why they were deleted in the first place), and the second is a little more interesting 10 minute look as to how the Jennings deal with their revelation to Paige that they are Soviet spies. With so much quality television to choose from, networks always seemingly need to up their game and The Americans is a worthy opponent for almost anything else airing. If you've never seen it, I suggest you start binge-watching season one through three as season four has just begun. There are far worse ways to spend an hour of your week. Download The Americans: Season 3 from the iTunes Store in Digial HD.